What causes most chimney damage? 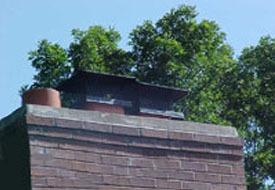 A fireplace top damper is a specialized chimney cover that replaces an old fireplace damper. You open and close the top damper by pulling down on a chain from inside your fireplace. When closed, it seals tight against heat loss, rain entry, and all animal entry. *Note: The fire must be out before you close either the top damper or the combination chimney cover/top damper. This is the best of both worlds. This will prevent heat loss and also help keep most animals out, even when the damper is still open. It gives you the best protection available. 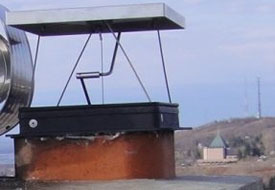 When closed, this will prevent all animals, including bats and insects from entering the chimney.